Greetings to all my good friends in music video land! It’s Andy Gesner and the indefatigable staff at HIP Video Promo, back with another outstanding clip from an emerging act and one that is an incredibly special video for all of us here at HIP. We are very happy to inform you all that the I Love You But I’ve Chosen Darkness “According To Plan” video is HIP Video Promo’s 300th video promotion! We want to thank you all for your support over the years and we look forward to a long friendship in the years to come. I Love You But I’ve Chosen Darkness has been touring and putting out records since the beginning of the decade – but the underground success of their latest release has brought them to the attention of a much larger audience. Their name may be a mouthful, but it’s also instructive: this music is dark, distant, and ominous, but there’s a hot emotional core that bleeds through the mixes. The chilly textures and spare arrangement architecture of their songs evokes memories of Factory Records and images of the cloudy northern skies of Birmingham and Manchester. But this quintet actually hails from Austin, and they’ve manufactured these cold hallucinations under the scorching Texas sun. Another well-known Austinian – Spoon’s Britt Daniel – produced I Love You But I’ve Chosen Darkness’s debut EP. It’s easy to see why Daniel was attracted to ILYBICD: they share his cool measured and near-mathematical approach, and they understand the intensity generated by repetition. But the band’s latest work, Fear Is On Our Side, adds entirely new dimensions to their sound. This time out, Paul Barker of the Blackouts and Ministry is behind the mixing board, and he’s helped the group achieve a seamless integration of their pop smarts, their ambient/electronic ambitions, and their rock muscle. Flashes of The Cure, Joy Division, New Order, and Talk Talk are discernable in these tracks, but ultimately Fear Is On Our Side sounds like nothing other than itself. 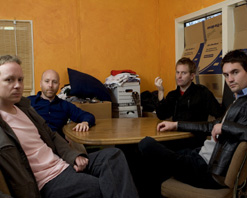 “According To Plan” is a prime example of how dramatic ILYBICD’s spin on danceable post-punk can be. The song begins with a machine-like bass throb that refuses to be tugged into modulation by the guitar. The bass countdown locks in with brittle drums and lacerating riffs; by the time Christian Goyer’s cool voice joins the instruments, a mood of destabilization and intrigue has been firmly established. All the parts snap together like a jigsaw – and when the picture comes clear, it’s spooky, stylish, bleak, and hypnotically fascinating. The clip for “According To Plan” simultaneously preserves and broadcasts some of that mystery. The faces of the bandmembers are projected on panels – but when we see the band play, they’re nearly swallowed by blackness. Backlit and clutching instruments, their bodies are shadowed; the spotlights shoot light over their shoulders, washing the camera in cold radiance. The dark soundstage is most likely inside some kind of factory or loft – we’re given an establishing shot of a city rooftop at the beginning of the video. The heads of the members of I Love You But I’ve Chosen Darkness crown the building, superimposed over the brickface and white posterboard as if they’re component parts of the industrial landscape. Here at HIP, we’re lighting up with excitement about teaming up once again with Jonathan Cargill and all the savvy and adventurous music lovers at Secretly Canadian to bring you this standout new video. We’ve got a nice cache of theAccording to Plan EP and the band will be on tour throughout the summer time, so if you need on-air giveaway goodies or would like to set up an on-air interview, we’ve got you covered. If you need more info, call Andy Gesner at 732-613-1779 or e-mail us at HIPVideo@aol.com. You can also visit www.secretlycanadian.com, www.chosendarkness.com to find out more about I Love You But I’ve Chosen Darkness.